In an article today in the Macon Telegraph they report that Romain Dallemand is seeking $10 million in a lawsuit. The article was very short and lacking any real details. You would think an article about a lawsuit over a severance agreement would include the actual agreement. No worries, I have included it below. A few weeks back the Telegraph published more more substantial article when Dallemand first resurfaced that explained he was fighting to reverse the decision by the Georgia Professional Standards Commission to have his teaching license reinstated. Since that time the PSC have already decided that they will not reverse their decision. Although the article today was rather lacking in substance it did provide two interesting nuggets of information. The first is that Dallemand is living in Florida and the second is that he has the audacity to sue Bibb county after he was responsible for around $52 million flushed down the toilet. That takes some kind of brass balls. Maybe this stunt will finally get the various agencies who are supposedly investigating him which include the FBI and others to get off their asses and indict him. As long as they believed he was in Haiti they might have thought it was more trouble that it was worth, but now that we know he is in Florida that makes things a whole lot easier. The $10 million dollar lawsuit is over his severance agreement. You can view the entire severance agreement below. Four of the board members that include: Thelma Dillard, Ella Carter, Wanda West, and Tom Hudson signed an attachment which included Dallemand’s “accomplishments”. I use that term very loosely. It is essentially a reference letter and noticeably absent are the signatures of the other four board members. I have to believe that Thelma Dillard would likely not sign that reference letter now. She has wised up quite a bit since that time and no longer seems to be under his spell. The lawsuit is over paragraphs six and seven in the agreement. 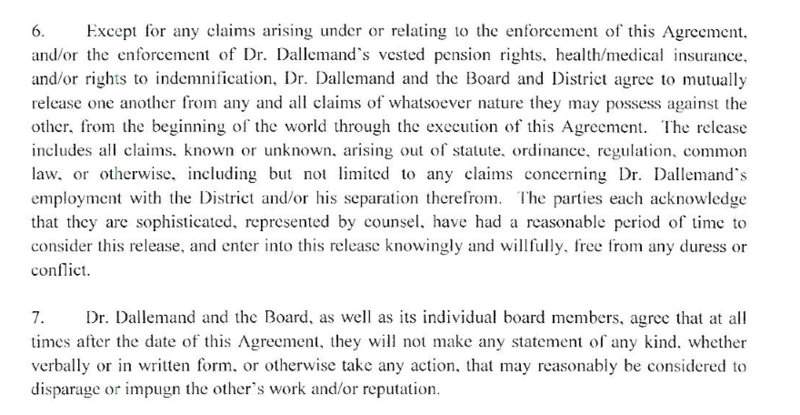 Dallemand maintains that school board members “flagrantly and intentionally” breached his severance agreement and committed “acts of libel and slander” against him. There is no question that his severance agreement was far too generous. You don’t reward an incompetent prick that wants to quit right after his contract has been renewed. He should have been fired with cause and given nothing but the boot and an orange jumpsuit. This only encourages future employees on contracts to renew and then quit soon afterwards. Why would anyone ever decide to actually work at a job when they can get paid more to quit. How many of you wouldn’t quit if you were offered $350,000 to do nothing and still could find a new job to make even more that year? I also understand that the Board of Education was split down the middle 4 vs. 4. Four of the board would have loved to have given him far more money than he received and four remaining ones would likely have preferred to see him indicted and behind bars. This severance was apparently a compromise. I prefer the term pyrrhic victory. I applaud Lester Miller for being the only one on the BOE to stick to his guns and vote against this severance agreement. This latest $10 million lawsuit is a perfect example of why it is better to look long-term than short-term. Even if it meant Dallemand staying a while longer it would have been worth it to clean up the mess that still infests the system. A thorough investigation might have allowed us to disentangle from Whitby and Promise Center at a cheaper price for example. Paragraphs six and seven should never have been included, but I am not sure Dallemand understands contract or criminal law. Regardless what is included in those two paragraphs, a severance agreement cannot indemnify you against criminal acts. If Dallemand committed illegal acts then there is nothing any contract or agreement could include that would protect him from indictment or prosecution. Contract law does not supersede the annotated code of Georgia or Federal laws. In fact in the 5th paragraph the agreement includes this phrase “To the greatest extent possible under the law the Board and District shall indemnify….” In other words they acknowledge their authority cannot supersede law. If Dallemand is suing over libel and slander he might want to look up those terms. For something to be libelous it has to be untrue. Libel is the written form of defamation, distinguished from slander, which is oral defamation. Dallemand will need to prove whatever was said or written about him was a lie. In order to prove any of that he would expose himself to the discovery phase as well as sworn testimony. Perhaps he would be wise to leave well enough alone because if he actually tries to sue there is a good chance even more information will be revealed. The only possible motive I can think of for this preposterous lawsuit is he has run out of money. $350,000 is nothing for a big-spender like Dallemand who loves those $125 meals and crabtinis. I am guessing this is a lawsuit out of desperation because no one else will hire him. It is not often you will find a BOE like the ones in Rochester, MN or Macon, GA that will hire an unqualified person like Romain Dallemand as a superintendent. He struck gold twice but I think his luck has run out. Monsieur Dallemand may rue the day he filed this suit because it may open a can or worms that may devour him. He fondly remembers his BOE5 puppets and thinks the current BOE will cave in and not put up a fight. That would be a miscalculation. He still has three compliant puppets left, but four and possibly five will not be quite so eager to send any more money his way.